Having been a tomboy most of my life, I was surprised at how quickly I fell in love with fabric and thread. I came to sewing almost 15 years ago when a friend suggested a “Girls Night Out”, and she picked a sewing class. I had had rock climbing in mind, but decided to go along with her. Ironically, she dropped out, and I have continued the love affair. 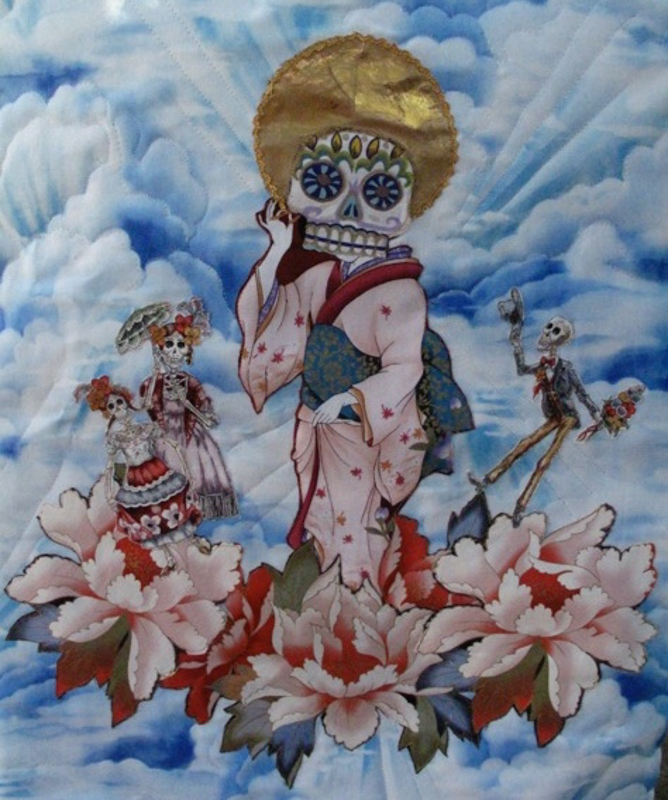 I enjoy blending techniques (paints and appliqué and embroidery all on one quilt) as well as themes (East Meets West – Asia and Mexico – Day of the Dead). 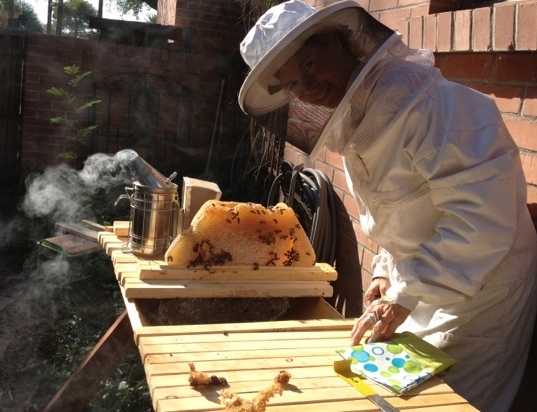 Spending as much time as I do outside, keeping bees (or being kept by them! ), heirloom poultry, heirloom chiles, and cloven hoofed animals, I feel myself to be an extension of nature. The animals and insects I learn from/steward often set up metaphorical homes in my quilts. I love to “free motion” quilt! After all, animals/insects move freely, not in straight lines – so you will not find many straight lines in my quilts. All three of the Quilts for our Ft Lowell Show have either a subtle or obvious Day of the Dead theme to them. Telling the Bees: a glimpse into an old Irish/Celtic tradition. When a beekeeper died, someone from the family was sent to “tell the bees” of his passing lest the hive take offense – and swarm. I love this concept because it reflects the culture’s acknowledgement of the interconnectedness of bees and humans; one that modern mainstream beekeepers often forget. Black crepe was hung over the hive, so I placed black crepe in the granddaughter’s hand. 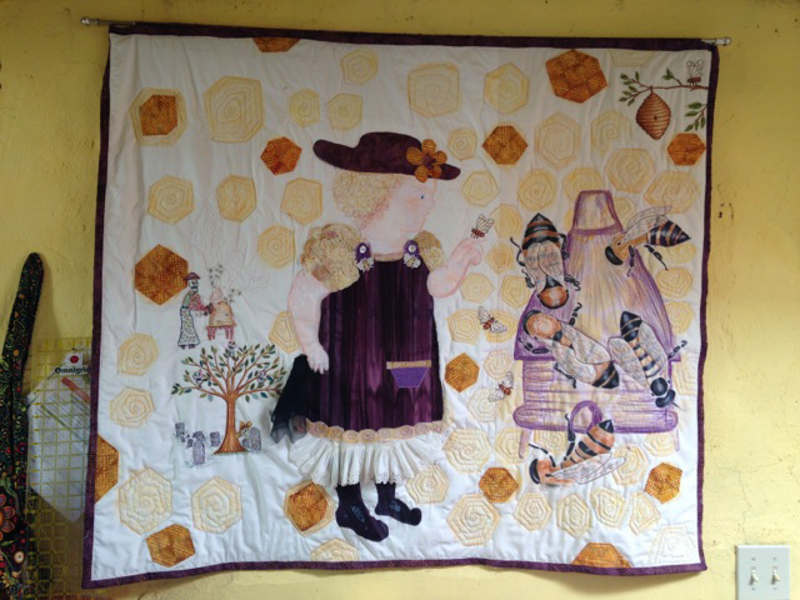 You can see the grandmother (hand embroidered calavera) beekeeper who had recently died, still keeping her bees on “the other side”. Apis Melifera Becomes Apis Calavera: a Day of the Dead theme addressing Colony Collapse Disorder. It is an Ode to all the bees who have died worldwide. Can you find the Queen Bee Calavera? And do you notice the surprise in the border’s echo-themes toile? 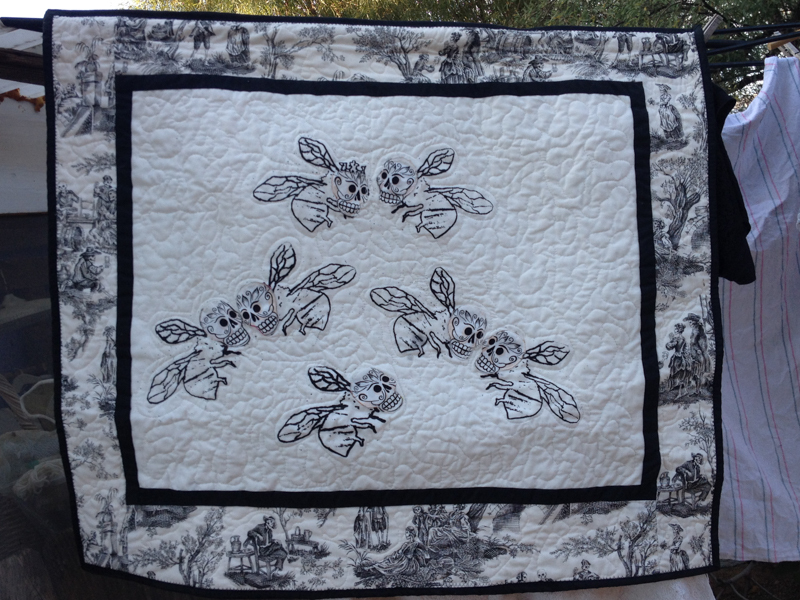 I will donate the proceeds of this quilt to a Pollinator Protection organization called XERCES. East Meets West – Dia de Los Muertos Geisha con Calaveras: a playful Day of the Dead piece. The tiny Calaveras dance upon lotus like flowers instead of marigolds. And Our Classy Geisha appears to be enamored of her own beauty even in death.